Let me begin by saying Happy Halloweeen! Tonight we are cuddling up and husband is watching whatever scary movie he chooses while I plug my ears and cover my eyes. If you know me, then you know I am terrified of anything scary. Like I use my phone as a light to get to bed once I turn our bedroom light off kind of terrified. Its bad. But its Chase's turn to pick because on Friday he made me one happy girl and went to see Footloose with me. Now I wont lie, it was super cheesy. Like cheesier than I thought even possible. But it was cute and definitely worth the $14 (we saw it matinee) plus the $5.50 for a medium popcorn. So now I feel like I owe husband forever because technically, any one of his friends could have revoked his "man card" for seeing that movie. But he loves me and didn't tease me too much for crying when they drove off to the dance. 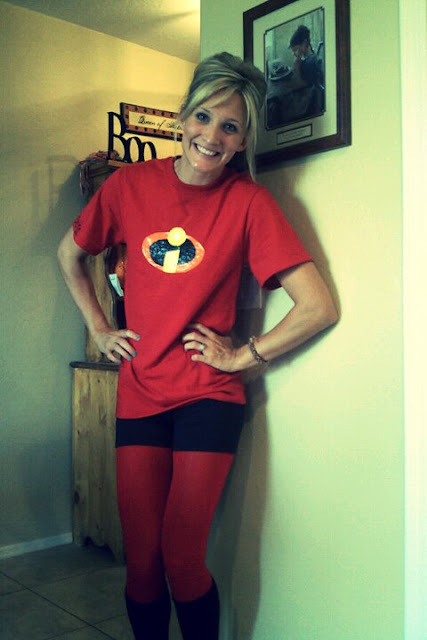 The kids kept asking which Incredible I was... I hadnt really thought about it. They decided I was Incredible Erika, the Incredible coach. Awh shucks they flatter me. Anyways I decided this would be my halloween costume this year and made husband a shirt as well. Unfortunately he wont be in tights. Maybe next year as peter pan? Ill keep my fingers crossed. New shop up on the blog. Or just click the shop link just under my blog header. Hawaii is amazing. Like best thing ever. Lots of pictures coming in the next few days.